Green beans (American English), French beans or runner beans (British English) are the unripe fruit of any kind of bean, including the yardlong bean, the hyacinth bean, the winged bean, and especially the common bean (Phaseolus vulgaris), whose pods are also usually called string beans in the northeastern United States, but can also go by snap beans. 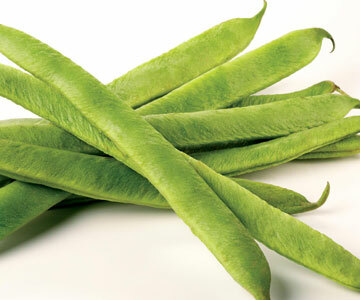 Green bean varieties have been bred especially for the fleshiness, flavor, or sweetness of their pods. Haricots verts, French for “green beans,” may refer to a longer, thinner type of green beans than the typical, American green beans. The first “stringless” bean was bred in 1894 by Calvin Keeney, called the “father of the stringless bean.” Keeney worked in Le Roy, New York. Green beans are found in two major groups, bush beans and pole beans. Bush beans are short plants, growing to approximately two feet in height, without requiring supports. They generally reach maturity and produce all of their fruit in a relatively short period of time, then cease to produce. Gardeners may grow more than one crop of bush beans in a season. Green beans are of nearly universal distribution. They are marketed canned, frozen and fresh. Green beans are often steamed, stir-fried, or baked in casseroles. A dish with green beans popular in the southern United States, particularly at Thanksgiving, is green bean casserole. Some restaurants in the USA serve green beans that are battered and fried. Green beans are also sold dried and fried with vegetables like carrots, corn, and radishes. Green beans are also rich in vitamin C.